Answer: That’s a good question, the answer to which goes back many moons. Fact is, the “start date” of the year differs among cultures. There’s currently about 40 different calendars in use around the globe. China, for example, celebrates the new year on a variable date between January 21 and February 20. Western society uses the “Gregorian Calendar,” decreed by Pope Gregory (with the help of his Jesuit astronomers) way back in 1582 AD. It’s a modified version of the “Julian Calendar,” decreed by Julius Caesar in 45 BC. Both calendars used January 1st for the start of their new year. Of course, whatever date one chooses to start the year, one (1) year is defined as the amount of time it takes Earth to complete one (1) orbit around the Sun. The calendar start date was an arbitrary choice made by Caesar. Some historians say his choice was motivated by political or religious concerns — we don’t really know for sure. Interestingly, Janus was the Roman god of transitions: one of his two faces looked back to the past, and the other toward the future. And the month of January is named for Janus. By 1800, most Western societies were starting their year on January 1st. 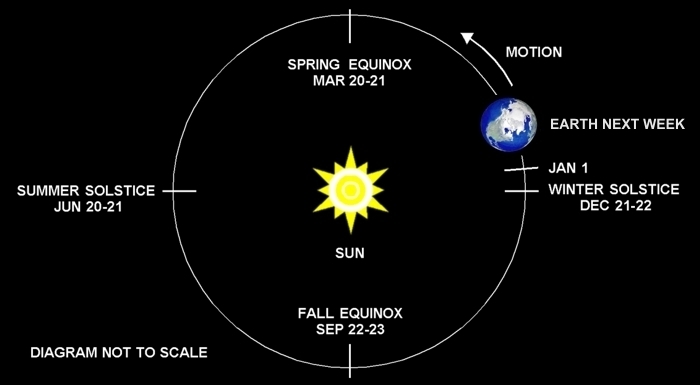 Previous to 45 BC, some cultures had used the Autumnal Equinox (September 22-23) to start their year. Some used the Vernal Equinox (March 20-21). But most used the Winter Solstice (Dec 21-22). It was a confusing mix of standards in an increasingly connected world. The Winter Solstice was an astronomically logical choice, since it’s defined as the start of Winter (north of the equator), and is also an extreme point in the Sun’s cycle of motion through the sky. One of the strongest motivations for calendar systems was to anticipate the changing seasons of the year. Consider that, in the not-too-distant past, survival depended on knowing when to plant, harvest, gather firewood, intercept migrating game or fish, and other such tasks that were synced to cycles of motions in the sky. There was a time in the history of our species when, if you didn’t personally find it, grow it, or hunt it … your family didn’t eat. Bottom line: January 1st was an arbitrary choice. So have a Happy New Year, whenever you choose to start it.